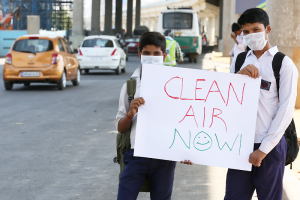 According to World Health Organisation (WHO) study, 98% of children in India under the age of 5 in low and middle income family is exposed to toxic air. The study said, in 2016 over 1 lakh children of the same age died due to air pollution related health problems in India. Globally, nearly 6 lakh children under the age of 15 died due to the joint effects of ambient and household air pollution in 2016, WHO report titled ‘Air Pollution and Child Health: Prescribing Clean Air’ said. Another study by Greenpeace presented a grim picture of air pollution in India. The study said India as three world’s largest nitrogen oxide air pollution emission hostspots. The biggest hotspots which have highest level of air pollution in India are Delhi-NCR, Sonbhadra in Uttar Pradesh, Singrauli in Madhya Pradesh and Talcher-Angul in Odisha. The WHO study said a total of 101,788 deaths under the age of five — 54,893 girls and 46,895 boys — in 2016 were reported due to effects of air pollution in houses and outside. The report noted that air pollution is one of the leading threats to child health, accounting for almost one in 10 deaths in children under five years of age. Air pollution can also cause childhood cancers, asthma, poor lung function, pneumonia and other types of acute lower respiratory infection, the report said. Household air pollution from cooking and ambient air pollution caused more than 50 per cent of acute lower respiratory infections in children under five years of age in low- and middle-income countries, it said. The WHO report examines the heavy toll of both ambient (outside) and household air pollution on the health of the children across world, particularly in low- and middle-income countries, like India. Air pollution is now a health crisis all over the world. The WHO is urging countries to adopt many urgent preventive measures to bring down air pollution. The measures include switching to clean cooking fuels and heating technologies, moving to cleaner transport, having more energy efficient home and urban planning. Power generation needs to be made more low emission. ‘Community air pollution’ needs to be tackled such as discouraging community practices of waste burning. Children should specifically be kept away from polluted environment and playgrounds should be kept away from major sources of air pollution like roads, factories and power plants.